The Great Coat And Tie Experiment: Some Color! Finally a little color in my dress shirt. I'm pretty conservative (chicken) when it comes to color most of the time but I knocked out two birds with one stone with this shirt. I had been wanting to try out Lands End wrinkle free shirts and I had wanted to add a little color to the wardrobe. Their overstocks (clearance) section had this shirt in my size so I bought it. I thought it looked more purple than pink online. I thought I was really going to catch it for wearing a "pink" shirt. I only got complimented instead. That's got to be about the first time I've been complimented on a shirt selection. Next time I'm looking for some shirts I'll be motivated to add more color. I do like the feel of Lands End wrinkle frees better than the others I have. Maybe after a few washings it will catch up to the others. It's a straight collar, pinpoint. The spread of this shirt seems to be a bit wider than the other straight collars I have. It's sure to be a favorite since it actually got noticed. I'll have to figure out some other neckties to pair up with it though. Today's necktie is one of my favorites. I actually had it mind when I bought the shirt. It's a Paul Fredrick woven and I'm not sure there really is a background color since all the colors are equally represented. It's got several shades of purple and gray and some black to tie it all together, so to speak. It's kind of a basketweave pattern but the different colors don't really allow that to fully come through. 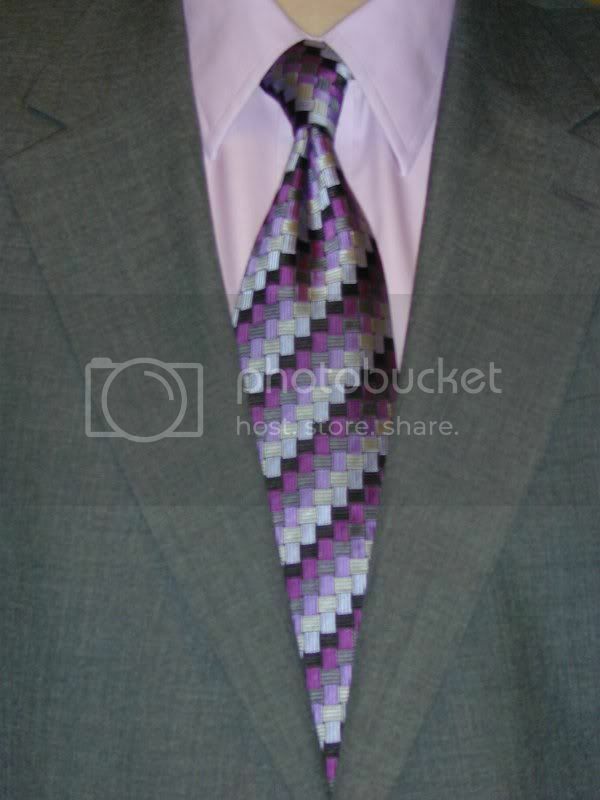 Four-in-hand knot once again. If I had noticed the collar spacing earlier I might have tried a half Windsor instead. I went with the gray sport coat today and black trousers. I had thought about swapping the colors around but ended up with this conglomeration. That leaves open the option to try it with the black sport coat sometime in the future. Since I like the combination of the dress shirt and tie, probably sooner rather than later.